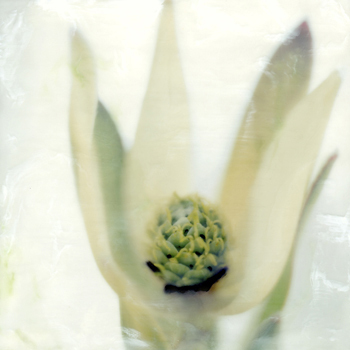 This May Whitney Art Works presents In Bloom, three explorations of flora by leading contemporary photographers Robert Diamante, Geoffrey Leven and Shoshannah White. In both concept and format, each artist takes a refreshing approach to this timeless subject. Currently a resident of Bali, Robert Diamante has created a book of photos inspired by Balinese canang, small arrangements of fruits and leaves that are created and placed around cities and towns as spiritual offerings. While Diamante’s work captures these beautiful objects, the artist acknowledges that “the offering is the act; it is the moment of interlacing when the realm of the created world and the complex cosmology of Balinese Hinduism intertwine; an intention that prevails over an artifact. 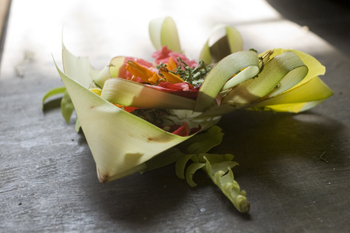 And once performed, the offering is not meant to be superseded by the ephemeral palm leaf basket, the flowers, rice and betel that lay exposed to the various modes of consumption scanning Balinese sidewalks: ants, roosters, and the ever-present Bali dog.” When Diamante goes out to photograph “offerings”, he realizes that the offerings were done, and what––of this world––could be called evidence lies baking in the sun. Geoffrey Leven's current photographic work is achieved through non-traditional equipment. In a constant pursuit of new ways of seeing light, Geoffrey experiments with non-traditional equipment as well as antiquated and throw-away cameras to digital scanning beds. Focusing on an eclectic range of natural and found light conditions, Geoffrey captures brief and mysterious moments “just inside” the life of the flower. Whether presented on an intimate scale or a wall size installation, these painterly photographs manage to project the magic of common flowers as exotic characters from another world with a broad range of mood and presence. Stark, sensual or even humorous, Geoffrey Leven’s work stands guard in a realm all its own, quickly becoming the property of the viewer's own imagination. What lies below the surface has been a constant curiosity for Shoshannah White. Fascinated with layers, she works with materials which bury and reveal, penetrate and protect her photographs. The images in this exhibition begin as traditional photographs and are transformed through encaustic painting. By building up the surface, the work begins to develop its own story - with details fading and emerging - a mirror of her personal understanding of the world. In Bloom will be on view from May 2nd to May 31st with a reception during the First Friday Art Walk on May 2nd. To see more images, visit the artist’s individual websites below.